I visited my homeland a few days after Christmas. It was amazing. 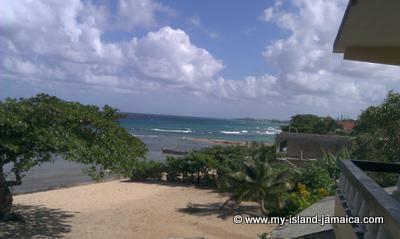 I stayed at a villa in Runaway Bay, St Anns. This picture i fell in love with is the view from the balcony of our room. The ocean is beautiful, the sound is amazing & it was so peaceful. I was there with my darling husband & we enjoyed waking up to & going to sleep with the peaceful sound of the ocean. We visited & tour a few places & visited a park overlooking the ocean on our way back to the airport. I almost forget from being overseas so long how beautiful & serene my Jamaica was. I ate a lot of jerk chicken, sugar cane & oh my coconut water- my drink of choice. When i returned to the US i realized i didn't eat any beef patties :(, but that was okay. The few days i was there was amazing. I'm already planning my vacation for the summer. Can't wait to be there! !